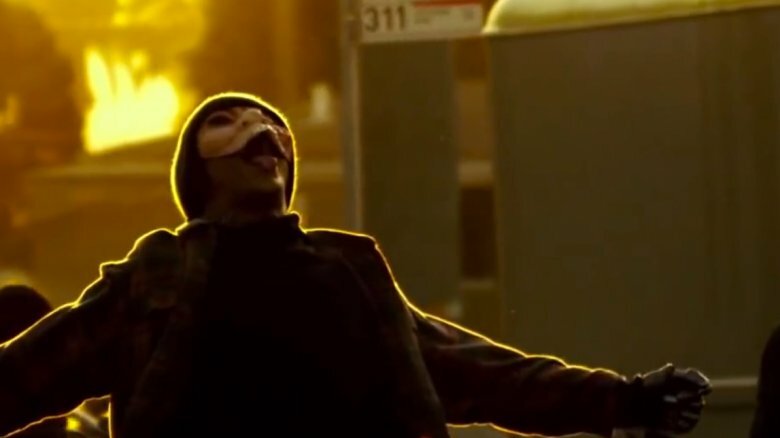 The Purge series has been with us for … wow, has it really only been since 2013? Sort of feels like you can't remember a time before it existed, like an infected tooth or themed Monopoly. 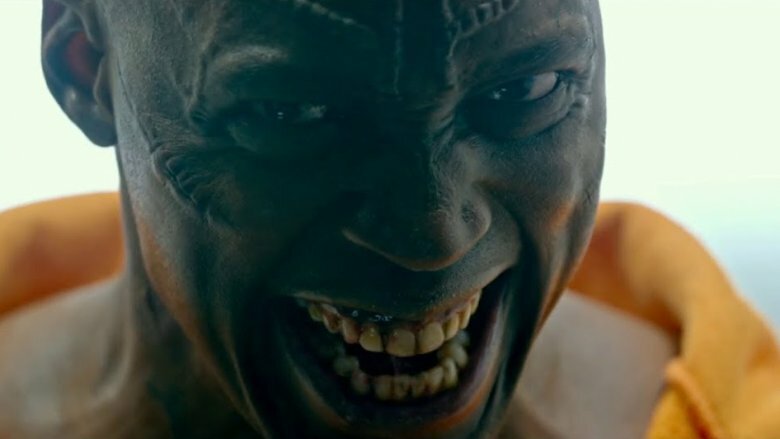 Since their inception, the Purge movies have fascinated audiences by presenting a satirical take on American culture with all of the subtlety and acerbic wit you could expect from a franchise produced by Michael Bay. As the films progressed, the social commentary became more an more pronounced. And we would know. See, there are plenty of rules when it comes to power houring all the movies in a series. You're supposed to take breaks. Maybe go for a walk, get some fresh air. But in the true spirit of The Purge, we elected to eschew these guidelines. We sat down and watched all of the Purge movies, one after another. We binged The Purge. We Purge-splurged. Here are some of the dumb things we noticed while we were doing it. Consider, if you will, mother nature and her sprawling variety of birds of prey, each specialized in a certain field to the point of near perfection. There's the Swainson's hawk, with its ability to pluck tiny insects out of the air. There's the red-tailed hawk, adaptable to almost any climate in the continental United States. And then, there is the Ethan Hawke. As presented in 2013's The Purge, this majestic creature is shown to be an expert in home defense. As a security salesman, he's made a comfortable living knowing his product inside and out. He understands his job so well that he knows exactly what to worry about when a bunch of prep school purgers show up at his door: a battering ram. Maybe a truck with some tow cables. 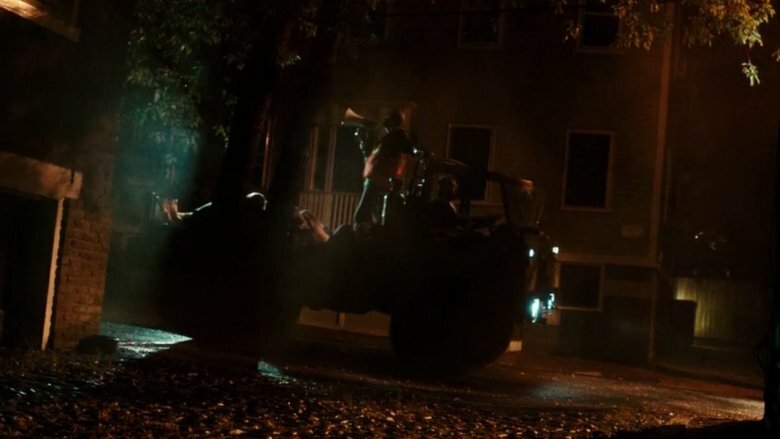 What's the point of a security system that can be taken down by a Jeep with a winch on the one night of the year when everybody's mom has a Punisher battle van? Think about how often we see freakshow masochists driving souped-up deathmobiles in the rest of the movies. Doesn't it seem like being those-proof would be a pretty necessary selling point? What's the creepiest toy you remember having growing up? For a lot of kids, the answer might be "a Garbage Pail Kid doll" or "that Street Shark I microwaved" or "a Furby." But those kids didn't grow up in a fascist dystopia with a thinly disguised witness protection program Cersei Lannister for a mom. 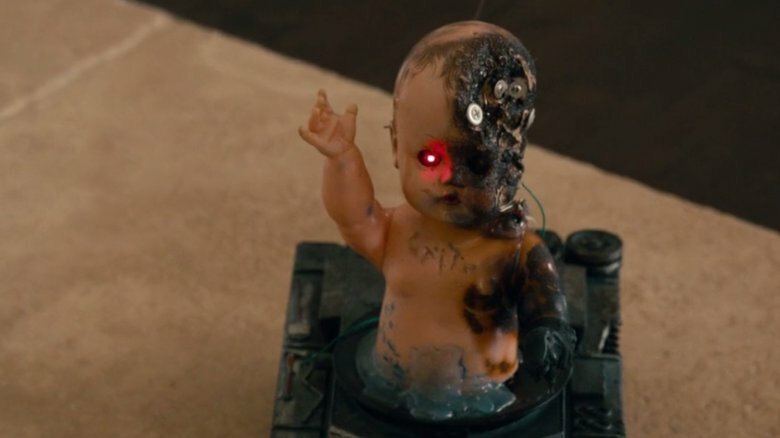 Charlie's favorite toy is a remote control real-time video drone on wheels with a half-exploded baby doll melted to the top of it, which must've been a real kick in the pants to see on his Christmas list. He loves that thing. He uses it enough that his mom isn't even fazed by its seriously unsettling Sid-from-Toy-Story-designed-the-Borg presence. We only bring up the thing's ever-present nature because it seems like a seriously underutilized resource. Wouldn't you feel much better sending a zany toy to do murder recon from the comfort of your panic room than you would Die Hard-ing your way through your own house hoping not to get stabbed? Look, there's no denying that everyone has a dark side they need to indulge from time to time. 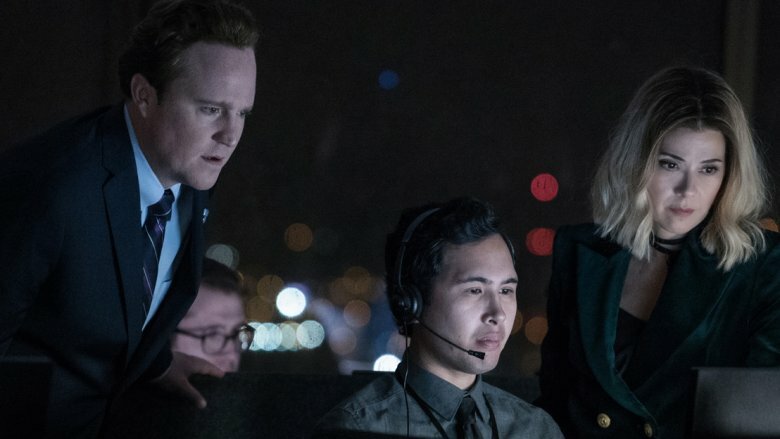 That's sort of the whole point of the Purge series if you turn a blind eye to the thematic equivalent of a series of neon billboards flashing the words "GENTRIFICATION ISN'T GREAT, YOU GUYS." It's not the fact that everyone gets stoked on domestic terrorism once a year that should bother you. It's that they all apparently decide to treat it like a shockingly well-funded community college burlesque show. There are plenty of examples throughout the films, but let's focus in on the precedent-setting offenders in the first instalment. They dress like a group of private school super-seniors at an age-play convention. Two of them spend most of their evening skipping in circles with machetes, which seems like a wildly inappropriate expenditure of time for psychopaths on the one night of the year when they can really let their hair down. The only member of the gang that uses harsh language to facilitate a hasty exchange with the protagonists gets shot in the head for his trouble, all so the ringleader can keep monologuing like he's in a Joss Whedon-directed production of King Lear. And they're the tip of the iceberg. The sequels are soppy with weirdos in weirdo masks speaking in verse while they weedwhack their neighbors to death. Basically, the question you have to ask yourself is, how many just-below-the-surface maniacs took high school theater classes, and how are they the alpha dogs in this scenario? Once the money train had left the station, there was no way the Purge engineers weren't throwing more coal in the sequel engine. That brings us to The Purge: Anarchy, and that brings us to more questions. Sequels beget expectations. Things have to get bigger. T2 meant more terminators. Aliens meant more than one Alien. And The Purge: Anarchy? Oh, you'd better believe it meant more purging. It meant a whole bundle more purging. We saw purging at a scale hitherto undreamt of. 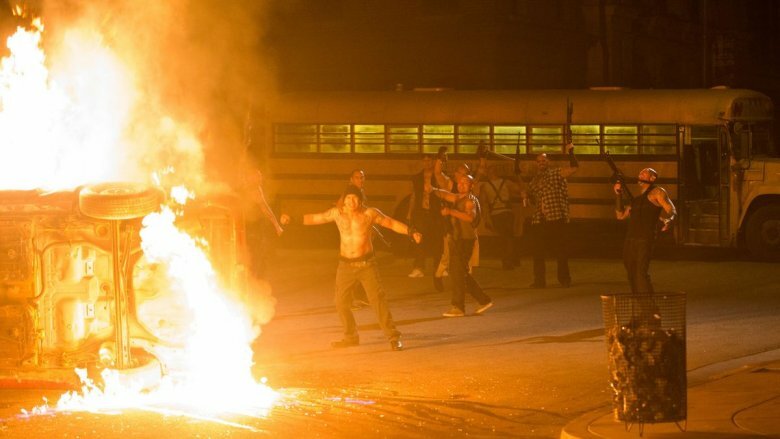 For the first time in the franchise, we see the full scope of the damage done by the Purge. Entire city blocks burn down, flames rising through the night sky as a testament to the great American new normal. This raises the question: Whether it's to cleanse the nation's soul or to reduce the low-income population, is it really worth losing, say, the MetLife Building? Whatever the purported positives of purging might be, they've got to be objectively minimal compared to the cost of vindictive credit card debtors going all Molotov cocktail-happy on the servers at American Express HQ every year. If you're fortunate enough to have spent any time with your grandparents, you've no doubt heard them lamenting the state of current affairs. For millennials, it was the unforgivable sin of young people wearing their baseball caps the wrong way around. For our grandkids, it'll be when we complain that nobody bothers to post photos of their brunch anymore once augmented reality Instahologram takes over. It's natural. Habits are hard to break, and nobody has an easy time seeing the traditions they grew up with relegated to the past. 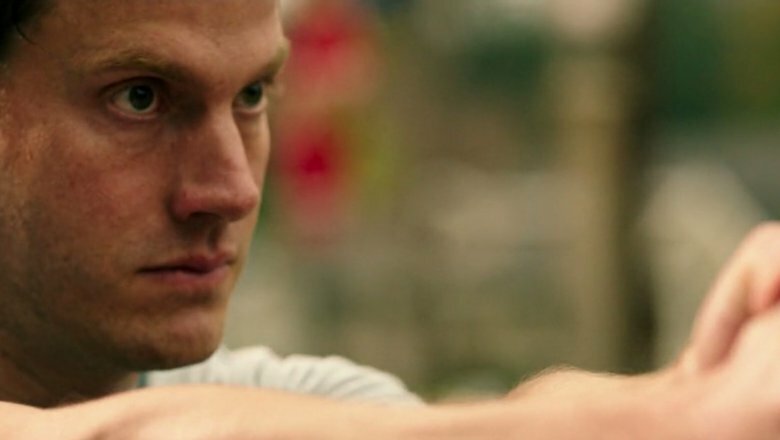 That's what makes it so unsettling when we see people like the old lady in The Purge: Anarchy gleefully auctioning off the opportunity to hunt the most dangerous game in a high-stakes laser tag arena. It's not the violence and inhumanity; if you've made it a movie and a half into the franchise, you're already getting numb to that. It's that Grandma adjusted so quickly to the idea that our new national holiday was a Slaughterpalooza. Yes, part of the point of these movies is that everyone has, as Grover so wisely put it, a monster in their mirror. It just seems like 60 or so years of adapting to the idea that murder is wrong would've made it more difficult to get stoked on National Stab Day. Ain't nothing, and we mean nothing, more rewarding than a redemption arc. Remember back when you thought Han Solo was going to just leave his friends behind, but then he swung around and one-twoed Darth Vader right in the spaceship despinner? Priceless. It's screenwriting crack. Here comes the big "but." BUT there's a difference between forgiveness and stupidity. 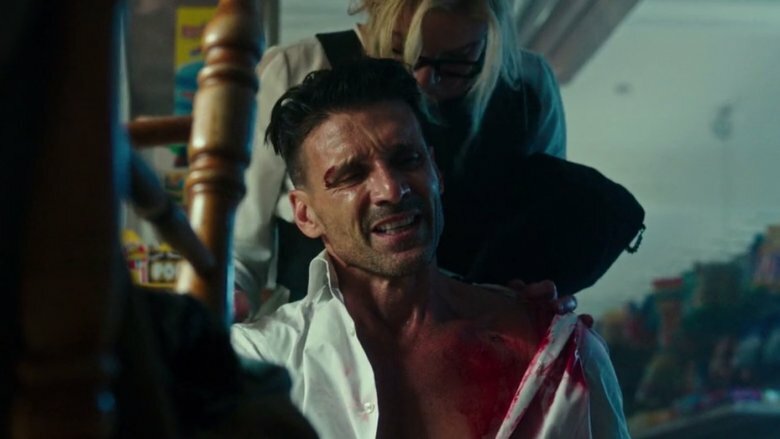 When Leo, aka Definitely Not Just Frank Grillo's Audition Tape For The Punisher, goes to confront the man who killed his son in a drunk driving crash, the audience has a pretty good idea that he won't actually go through with murdering the dude. Heck, they probably even have a feeling that Grillo is going to get saved in the eleventh hour by the famously steady shooting that all recovering alcoholics are capable of. All that is beside the point, though, since it's frigging bananas that the group trusts the Drinksalot the vehicular manslaughterer to drive them to the hospital after. 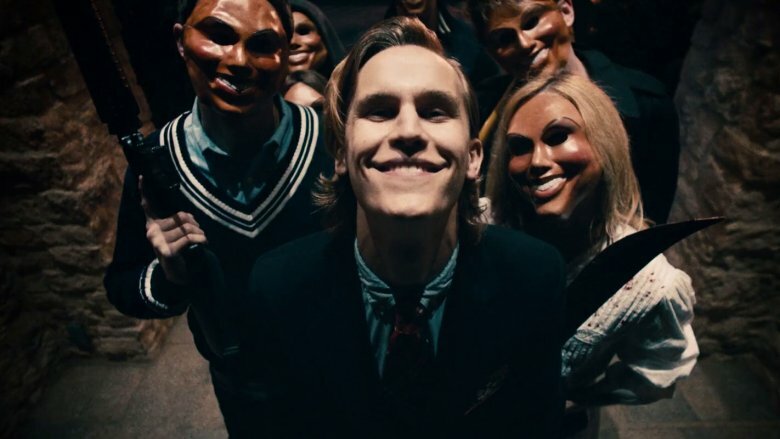 The Purge: Anarchy tells us that the real point of the Purge was never to give potential serial killers a day on. The actual purpose is to give Ayn Rand enthusiasts a series of life-changing nighttime emissions by killing off people dependent on government assistance. We're told that this has salved an otherwise untreatable economic crisis. Yay liberty. Okay, ready for a fun but relevant lesson on the economic effects of removing that much spending from the economy and killing off everyone willing to work a service industry job? Fewer people spending money doesn't create a better economy. Fewer people working the crappy jobs doesn't, either. Much to the dismay of any Thanoses in the audience, fewer people in general is a bad thing. Populations tend to adapt to growing demands. They tend to collapse when everyone working to meet demands gets a piano dropped on them because it's March 21. Have you ever thought about all the ways you could die? It's a paralyzing concept. You could take a bad aspirin. You could slip on a patch of ice. That spider in your apartment that keeps getting back inside every time you scooch it out the door might secretly be a Winter Soldier-style Soviet sleeper assassin left over from the Cold War whose trigger phrase is "ah, there's that damned spider again." The possibilities are endless, doubly so on Purge night. 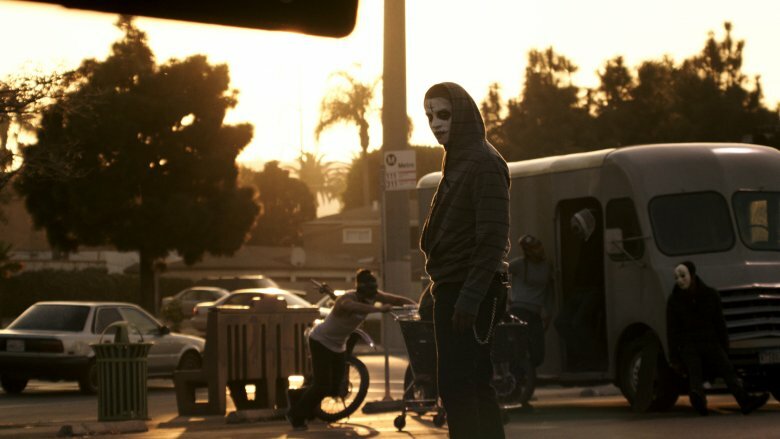 Who rides a skateboard to purge? Who looks at streets filled with human bodies, flaming detritus, and a thousand loose, lightly altered Spirit Halloween masks and thinks "sick place to ollie, bro"? Regardless of how good you are at skateboarding, that is the single dumbest mode of transportation available to you outside of a unicycle or one of those tiny Shriner clown cars. "But I don't have a car. Who does in this economy?" Yeah, bummer that you can't steal one without fear of legal consequences. It's right there in the televised alert: "Police, fire, and emergency medical services will be unavailable until tomorrow morning." Yes, that's a buzzkill bordering on being discriminatory toward people whose purge dream is to prank call 911 without fear of retribution. That isn't what's incongruous. What's incongruous is that with all of these services shut down, the government is still sending out body collection teams. Loud ones, with megaphones. Putting aside the logistics of telling a group of what are essentially CDC garbage men to hit the streets on Everyone's A Batman Villain Night, it's hard to imagine what the point is in the first place. "Alright, we've given the general public access to machine guns, flamethrowers, and Jigsaw-adjacent death traps. For twelve hours, everyone gets to maim and kill to their heart's content in the streets of every city in America. Our country will run red with blood. Any questions?" "Yeah, what if it gets yucky?" "Good point. Can't have that." So Frank "Not Castle" Grillo is doing his anti-hero-with-a-heart-of-gold thing, protecting one of maybe three politicians in U.S. history who were able to make it out of their 40s and look like they got literally any sleep since being elected. The bad guys are gunning for his employer hard. She has some wild ideas about ending the Purge, and they desperately want to punish her. Frank "no, 'punish her,' not 'Punisher'" Grillo takes a slug to the shoulder. He walks it off. He's just that flavor of indefatigable. But the joke's on him: There was a GPS tracking chip in the bullet! Now the NFFA is on their trail. Curse you, GPS bullets, if for no other reason than that you're ridiculous. Bullets, with their extreme velocities and habit of not loving to slow down, are a ridiculously funny way to put a tracker on someone. The ones that don't go all the way through a person do all sorts of other crazy stuff, like fragment or "mushroom." Breaking into a dozen pieces and being inside of a piece of metal that rapidly expands or contracts? These aren't generally the best ways to keep sensitive electronic equipment working. 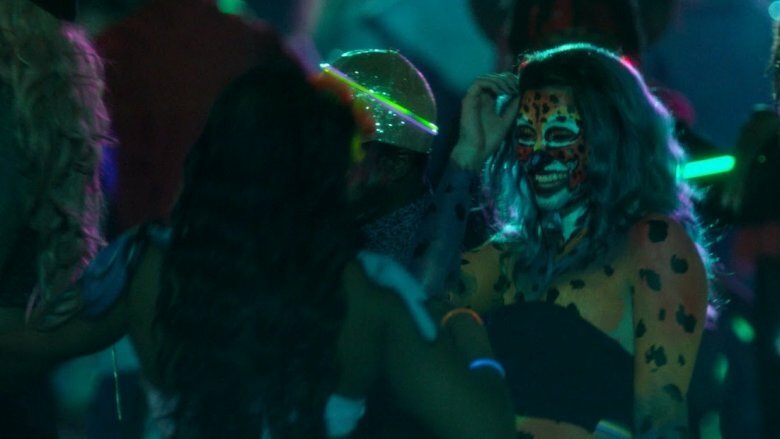 Filled to brimming though the Purge movies are with colorful sociopaths, The First Purge probably takes the cake. It introduces us to Skeletor, a man so crazy he's not even scared of being sued by the He-Man legal team. He's unstable. He's unpredictable. He is, as the song goes, altogether ooky. He's Victor Zsasz on NoDoz. The lad's a menace. And it is bonkers that he's not already in jail. As backward as the New Founding Fathers' society might be, it's difficult to imagine any nation so dystopian that they wouldn't arrest this guy. He acts like a background character on one of the antagonist ships from Pirates of the Caribbean that got fired for trying too hard. He carries a razor blade in his mouth, which seems like a problem that should've self-corrected a while back considering how wacky his facial expressions get. But hey, being a weirdo isn't a crime. You know what just might be, though? Smoking crack, which is something that he openly admits to while talking to a government official during the first three minutes of the film. This is not a man possessed of a working survival instinct. This is a human cry for attention. And when he's crying "I love doing drugs" in front of a cop, he probably shouldn't be on the street. You love Marisa Tomei. We love Marisa Tomei. As pleasant a surprise as it was to see Marisa Tomei, there's beef to squash here. So within the Purge universe (which we have zero intention of referring to as the Purgiverse) Marisa Tomei plays Doctor May Updale, a name that undoubtedly prompted more than one "What's Updale? / Nothing, Dave, what's up with you?" joke around the Purge office. The good doctor is responsible for the creation of the Purge. She concocts it as a social experiment, wondering, one can only presume, what's the worst that can happen? Then, and hang onto your hats, the worst happens, with "the worst" here meaning "Purge stuff." Doctor Updale is appalled. More murder than the amount of murder she was expecting? But that's egregious! And how was she to know that government officials would take advantage of a situation like this? It's not like she's a psychologist … oh … wait. The point is, it's ridiculous that she'd be shocked that the Purge got violent. Her vision wasn't corrupted. It wasn't Frankenstein's monster. She offered people money to kill each other. It's just a shame that she never met anyone who could teach her about power and responsibility. So you're a Staten Island party animal, deep into whatever the kids like these days. Trap music, maybe, or dubstep, or Alan Alda. Whatever youth culture is about. Glow sticks for sure. Glow sticks are evergreen. You and your party friends turn your eight-track music down long enough to hear that there's a Purge a'comin, and it's a'comin on strong. The streets will be filled with the disenfranchised and the furious, eager to take their frustration out on the general populace without fear of recourse. Not only will they be allowed to kill, they'll be incentivized. Cash will be paid to anyone with the brass stones to start manning up and gunning down. There's an open bounty on anyone alive. How do you respond? Apparently by throwing a wicked rave in the middle of the road. It's like if the kids at Camp Crystal Lake showed up wearing Jacobian ruffs to accentuate which part of their necks Jason should aim for.